The Leonardo Hotel Koeln is located just 15 minutes from the Cologne / Bonn Airport. The Trade Fairground is just 8 minutes away as well as the concert hall which is reachable within 5 minutes walk. The hotel provides 161 spacious and air conditioned 4 star rooms where you will live and sleep in a pleasant environment. All Standard hotel rooms are equipped with bathroom- shower- WC- hairdryer- mini bar- radio- colour TV with national and international programmes- 2 telephones with ISDN and analogue connections and an individually adjustable air conditioning system. In addition- the hotel provides 4 disabled rooms equipped with a connecting door to another room and can be easily reached by wheelchair. 11 Superior rooms are at least 28 square metres and equipped with bathroom- shower- WC- hairdryer- mini bar- radio- colour TV with national and international programmes- 2 telephones with ISDN and analogue connections- an individually adjustable air conditioning system and W-LAN von T-Mobile. In addition to the Standard rooms the Superior room provides a generous seating area or a large work area and a bath robe. Personal service and friendliness are part of our contrasting combinations which make the hotel the unique setting for your stay. Hotel facilities include a dinning restaurant- a bar and a modern equipped fitness and regeneration area. 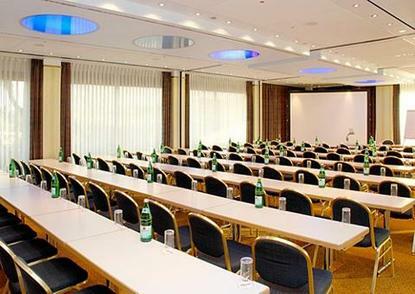 The hotel has 18 conference rooms with capacity of up to 200 persons. The hotel offers ample and secured parking space for 110 cars.